Andrew Connell - Jacksonville Office Geeks - October Monthly Meeting: WSS v3 Features! Introducing Features! A Deep Dive into the New "Feature" Infrastructure in Windows SharePoint Services v3 Microsoft is introducing a new concept to Windows SharePoint Services (WSS) v3 called Features. Features are a more portable and modular framework you can use to deploy new functionality to WSS v3 and MOSS 2007 Web sites. They address one of the pain points in WSS v2 in which it wasn't very easy to deploy new functionality to a WSS v2 Web site after the site was provisioned from an underlying site definition. Features are also used to deploy site customizations, event receivers, workflows, and content light-up. In this meeting, Andrew will introduce the new feature framework, demonstrate how they can be used with live demos, and how you can utilize them to deploy your own custom solutions to new and existing WSS v3 Web sites. In addition, we will take a deep dive, exploring how Microsoft uses features to implement this new version of SharePoint (WSS v3 & MOSS 2007) and demonstrate how you can use features to build complete applications and solutions on top of Windows SharePoint Services v3. This isn't going to be a two hour presentation... I'll have a few slides (less than 10) to simply convey some info about the new Feature framework, then its demo heaven baby! We'll be in a virtual machine for most of the night. While the talk will have structure, if those who attend want to explore some things I wasn't planning to cover, we can do that (I just ask that we stay on the topic of WSS v3 Features). 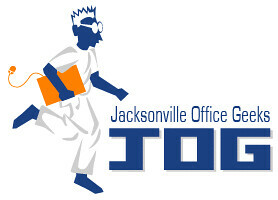 In a previous post, I mentioned we had our own Web site, www.JacksonvilleOfficeGeeks.org. Unfortunately its down right now as it looks like our host tried to update from WSS v3 Beta 2 -> Beta 2 Technical Refresh and things didn't go as well as planned. We're working to get things back up and running ASAP. We're back up! In addition, I'll bring a handful of the MOSS 2007 Beta 2 Technical Resource DVD's that were handed out at TechEd 2006 in Boston and at the Jacksonville Code Camp. Finally, if anyone needs Beta 2 Tech Refresh install bits, I'll have those on an external drive for you to copy to your laptop.